Blurb: The present day: the Orkney Ferry, where Ian Chesterton meets a stranger who he is able to confide in. Format: Limited-cast audio drama, a Companion Chronicle from the point-of-view of Ian. Published by Big Finish Productions and released as a free download for readers of Doctor Who Magazine in 2012 and then re-released with the Light at the End Limited Collector's Edition in November 2013. Setting: Earth: The Orkney Islands, Summer 1956. Ian relates this story from the Scotland to Orkney ferry around 2016 (he states its been 60 years since he visited the islands). Continuity: This story take place between The Dalek Invasion of Earth and the Rescue. Seemingly, it takes place soon after the novel, Venusian Lullaby. That story takes on immediately from The Dalek Invasion of Earth and in that same story the Doctor receives some instructions that he believes will allow him to steer the TARDIS. His announcement to Ian and Barbara that he can take them home would seem to be a continuation on that thread. Ian mentions the events that lead him to the TARDIS to Jeannie (see An Unearthly Child). The Doctor mentions the telepathic experiences that they had on the Sense Sphere (see The Sensorites). There is a lot of discussion about Susan's leaving and the Doctor's emotional state because of that (see The Dalek Invasion of Earth). Ian mentions that he's been thrown overboard in the Pacific (see The Transit of Venus), shipwrecked in the Mediterranean (see The Romans), and knocked unconscious in the mid-Atlantic (see The Chase). Barbara mentions the trouble that they had in Mexico (see The Aztecs). She also mentions their trip to Salem (see The Witch Hunters). Discussion: If there's one thing that this story has in spades, it is atmosphere. We go from discussing the sights and sounds of Earth to Ian and Barbara existing in a shadowy half-world. Then they're left stranded when the ship leaves them for seemingly no reason. From there we're stuck on misty cliffs until the chilling evening comes in and they get stuck on the bog. Then its a fast paced race through the forest and getting stuck in a cottage besieged by creatures that evoke imagery of the undead. I can tell you that listening to this while driving home from work at night was terrifying. I almost turned it off because it made me so jumpy. As always, William Russell was a joy to listen to. His delivery as Ian is perfect and you really feel that you're transported back to the time that he's describing and you can hear he, Barbara, and the Doctor discussing as if you're watching an old episode of the series. Sharon Small was also good and it was nice for a Companion Chronicle to allow the guest artist to play more than one part. Its happened before but always seems rare. Her Jeannie and Janet were good and it was nice to have the second voice both in the story and out of it and the accent gave a nice bit of color. I was fascinated by her attitude about the Orkney Islands, a place I knew nothing about until listening to this story, and I was surprised that they consider it so offensive to be described as Scottish. So even in this it evokes the feeling of early Who, since it was also an educational experience for me. The Marsh Wains were an interesting idea. I was glad to see a rational explanation at work once all was explained even if some of the details were made a little murky. Yet I didn't find them as scary as just the travel on the bog and the feeling of helplessness while sinking. That was just chilling stuff. Another concept that I liked was the idea of Ian and Barbara getting so close to home but even waiting around for 7 years would be difficult and it's nice that the discussion of the ramifications of that was made. I do feel that Ian Potter is not quite suited to the Companion Chronicle format. It seems that both this and The Alchemists wanted to be 4-part stories. We have nice, long set ups that last an entire first episode, which is very in keeping with the standard of the era. The problem is that the first Doctor stories would then have 3 or 5 additional episodes to develop what was introduced in that first story. In the Companion Chronicles you only have one more episode, so it feels that the ending is rushed. Either the buildup should be truncated or more episodes are needed. I hope that Mr Potter gets to do one of the Early Adventures because i think that in that format he'd really have a chance to shine. I also feel that there was something doesn't make sense. A lot of stock is put in the idea that the myths all exist because they're true even if the reason given for them is not. Yet the Marsh Wains were able to cross the water, which was something that they weren't supposed to be able to do. Thankfully the Doctor ignores this fact or he wouldn't have been able to make the correct deductions, but no explanation is ever given for why they're able to do that when the magnetic ore supposedly keeps them from doing so. Was the magnetism running a little low that day? Another thing that I didn't care for was Ian describing Barbara merely as a colleague. Surely he would describe her as his wife if they were married and I had thought that their marriage was considered canonical. Yet here he just says "colleague". The fact that she's not traveling with him I think would also imply that she's dead or I would assume that she'd have received the same message as Ian. Being a fan of Ian and Barbara, I don't really like the ramifications of that. I've already mentioned my feelings about how this doesn't quite fit in with The Rescue and the idea that the Doctor has been waiting for hundreds of years doesn't quite work. So, while I think that this is a pretty good adventure it has enough flaws to keep it from true greatness. 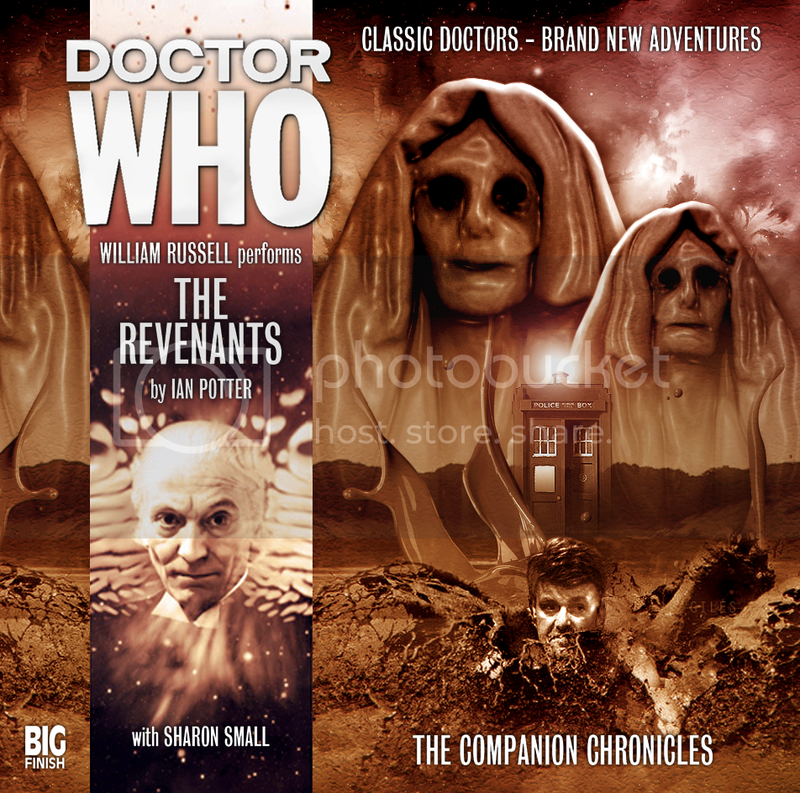 Recommendation:: It's a Companion Chronicle narrated by William Russell, what more do I need to say? As always, Russell is good. The plot is dark and tense, the kind of thing that you might want to listen to with the lights out but snuggled up in your bed or with a loved one. In the end, I think that you'll be pleasantly surprised if not totally wowed. I'd definitely recommend it.